held up at ingraham with crazy weather, rockfall, thunder, lightning, general mountain awesomeness. 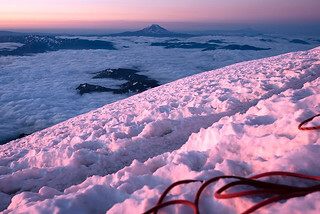 a great day summitting rainier in 2011!! We climbed Dissapointment cleaver. This year 2012 we tried again but were unsuccessful due to massive snowstorm. We only reached 13,000 ft this time before having to descend back to camp. we waited out storm for two days then went to Mt.Hood instead. A 4th of July climb via the Emmons that was awesome. Due to winds most parties threw in the towel early but staying one more day set the stage for sharing the summit with one other person! Great climb. Got to see a beautiful sunrise from summit. Cold! Altitude hit me pretty good. First time up Rainier. I'm hooked. Can't wait to go back for another climb. Blue sky, few clouds, unusually warm, very awesome climb. Thanks RMI! Climbed the DC leaving the car at 5 PM and returning to it at close to 5 PM the next day. We had a very limited time/weather window. I think we got about 2 or 3 hours of sleep at Camp Muir. It was awsome! Did the Schurman route. Perfect weather. Got up in time to watch the sun rise. Enjoyed this route much more than the DC route. From camp at Ingram Flats with Murad, Goran and Thomas. Respectable peak. Started at Paradise and camped at Muir, then at Ingraham Flats. Got turned around at ~12,000 ft. on summit day due to graupel buildup and avalanche danger. Great weather up to 13,000 feet. Then wind picked up visibility dropped to less than 30 feet. The trail was great and allowed us to push to the true summit, which made the long hike down to the car a little bit more enjoyable!